Welcome to Tennessee Shell Divers! 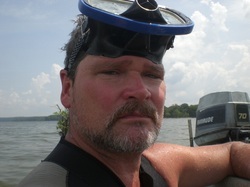 I have been a commercial mussel diver on the Tennessee River for most of my life. While looking for information about mussel diving on the web, I noticed that there is almost nothing out there about what we do. My name is Kenneth Frizzell and I am starting this website and blog to help document a vanishing proffession. There is a page devoted to the Discovery Channel documentary about mussel diving; "Dixie Divers". It features some of my friends as well as my daughter Tiffany Frizzell. I also have a small part. The air date is to be announced. 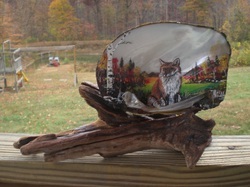 There is also a page devoted to my painted mussel shells. 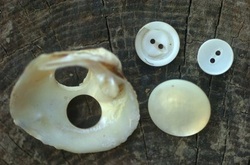 These are shells that we harvest from the Tennessee River. I have been painting on them for over 12 years and they are very popular locally and at arts and crafts shows. When I'm not diving, I devote most of my time to fine-art. I sign all my artwork with my nick name Frizz. The history page will explore the harvesting of mussels from early Native American times through today. The page is broken down into sub-pages for ease of use. 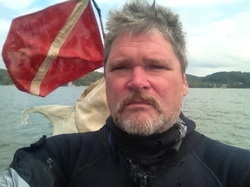 My blog will feature random thoughts, adventures and stories relating to my life as a mussel diver on the Tennessee River.